Fort Collins is filled with outstanding food and drink. 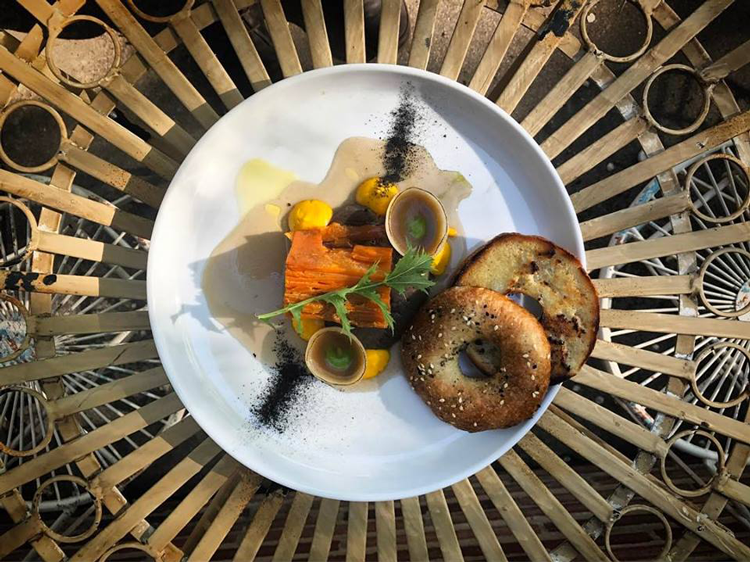 We’ve proven this time and time again with roundups of the best dinner restaurants, brunch spots, late night bites and even the city’s best pressed juices and smoothies. But when you’re catering to a special diet, dining out can be tough no matter what city you call home. We already rounded up 11 vegan and vegetarian-friendly restaurants in Fort Collins and now, we’re hoping to help those looking for gluten-free options in town. On our guide, you’ll find local restaurants, cafes, shops and tasting rooms to stop by for breakfast, lunch, dinner, dessert and drinks! Check out our picks then share your favorites in the comments below. Rainbow is a Fort Collins staple and, as such, has made many of our roundups — including best patios, vegan and vegetarian-friendly spots and best brunch restaurants. Located between Old Town and CSU, they’ve been serving up their garden fresh fare since 1976. Their breakfast and lunch menus are packed with gluten-free options clearly marked, so feel free to choose something like Green Eggs & Ham or Dan’s Groatmeal, a tasty oat and granola option. Urban Egg selects local ingredients from small producers as often as possible to offer fresh, chemical-free, delicious produce and meats — and that philosophy extends to their gluten-free flour. Colorado proud Deby’s Gluten Free Flour Mix goes into gluten-free pancakes and the gluten-free English Muffins that carry delicious Eggs Benedicts. You can also choose from granola and oat breakfasts, egg plates and breakfast tacos! La Creperie is one of the only places in Fort Collins to find French pastries and inspired meals. Come in for breakfast and you’ll find scratch made crêpes, galettes, croissants, brioches, baguettes and more! All of their must-try sweet crêpes are available gluten-free, as are the galettes, the kids’ items and the fruity and sweet macarons. Waffle Lab creations don’t have to be reserved for breakfast, but it’s definitely one of Fort Collins’ tastiest options. This FoCo favorite began as a food truck and now you can taste their Classic Liege Waffle from the truck or from the brick-and-mortar restaurant on West Olive Street. For just $1, you can turn any of their tasty combos into a gluten-free treat — from The Choc-ffle to Foster the Waffle, a treat topped with caramelized bananas, house-made Whiskey Caramel Sauce and fresh whipped cream. This breakfast paradise has been a Fort Collins favorite since it opened in 1933. 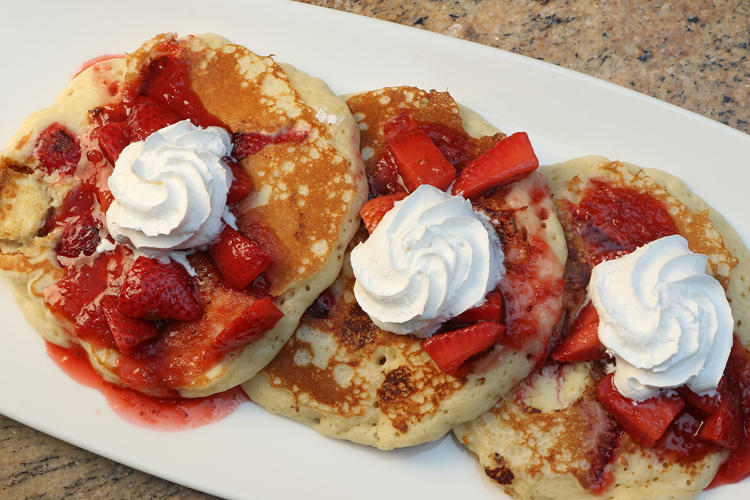 As the oldest restaurant in Northern Colorado, Silver Grill Cafe has had plenty of time to learn the ropes and perfect breakfast, especially when it comes to gluten-free options. Among other meals, their lineup of GF items includes breakfast tacos served on corn tortillas, tamales and a trout filet! The Gold Leaf is the brick-and-mortar creation from the team behind The Silver Leaf, one of Fort Collins’ favorite food trucks. Entirely plant-based, the seasonal menu is packed with inventive plates that can often be made gluten-free. With the restaurant’s recent reopening, they’ve changed their hours and added a to-go window serving breakfast burritos tacos 7 a.m. – 10 a.m. Monday – Friday. Follow the team on Facebook for current updates and get an inside look at The Gold Leaf Collective with our exclusive interview! Big Al’s keeps everything Colorado — from the old light fixtures salvaged from a Denver hotel to the custom hot dogs made in the Mile High City. The veggie burgers are handmade, the fries are hand cut and the buns come with a gluten-free option! With eight creative flavor combos on the burger menu, you can never go wrong with the famous 60/40, a patty made with 60% beef and 40% bacon. When you’re looking for gluten-free options, half the battle is determining which items are gluten-free and which aren’t. At Blue Agave Grill, they make it easy with a clearly marked menu filled with options that are gluten-free or can be made so. Choose from modern Mexican-inspired dishes like Blue Agave Fish Tacos with tempura-battered tilapia and pan-seared Southwest Pork Medallions. Dam Good Tacos makes all their food from scratch daily and uses only locally-sourced Colorado tortillas. In 2012, the shop started as a gourmet quick stop in Basalt. When co-founder Michael Falco moved to Fort Collins, he took a taco mobile cart to various local breweries until he and Ali Hatcher opened their full restaurant in Dalzell Alley. Today, you can find a full menu of earth-conscious, vegan, vegetarian and gluten-free options when you opt for a corn tortilla! At Blind Pig, they have a separate gluten-friendly menu so there won’t be any confusion when you’re ordering. Order an all-natural Angus burger with a gluten-free bun or order it as a lettuce wrap. Then, while they make your meal fresh to order, you can enjoy the atmosphere of one of the city’s best neighborhood sports bars! One of Fort Collins’ most popular spots, The 415 has an entire menu dedicated to specialty diets — including vegan and gluten-free. Choose from gluten-free pizzas, tasty bruschetta on gluten-free bread, polenta plates, steak and veggie skewers and more. Pizza is often a go-to option for gluten-free diners but at Beau Jo’s, they elevate classic pies to a mile high and higher. Their mountain pies are as huge as the Rockies they’re named for and their gluten-free crusts are some of the tastiest. Almost everything on the menu is available gluten-free so stop by the Old Town location and try a Colorado-style pizza! This Old Town favorite offers an online menu guide to make ordering gluten-free items easy. By listing their GF items and providing tips on alterations to classic dishes, you can cut the gluten out while still enjoying a FoCo staple. Check out the online menu here! At Walrus Ice Cream, they use only the finest, all-natural ingredients in their ice cream recipe which is free of eggs and gluten. Get your scoop on top of a gluten-free cone and you’ve found the most delicious, wheat-free treat in FoCo! From classics like Chocolate Mint and Caramel Sea Salt to creative concoctions like Cappuccino Butterfinger and even Blue Moon, there’s a flavor everyone can enjoy. 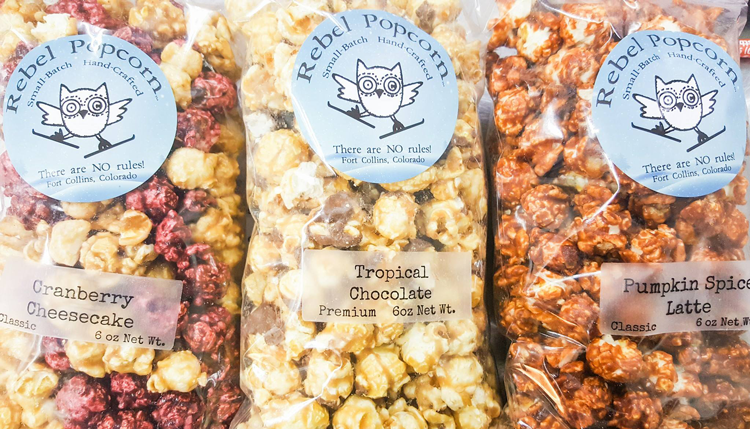 Popcorn is a go-to gluten-free snack for many, but once you try Rebel, you won’t want any other brand. This Fort Collins business offers flavors like Chai, Sea Salt Caramel and Bleu Cheese Caramelized Onion — and almost every single one is gluten-free! Only a few recipes have minimal amounts of gluten, such as the sprinkles on the Birthday Cake popcorn, so double-check when you order yours! Butter Cream Cupcakery is family owned and operated by Fort Collins natives and siblings Cassidy, Promise and Callahan Montoya. Driven by the Promise’s passion for baking, this bakery produces some of the city’s best cupcakes and most interesting flavors — including Chocolate Dipped Strawberry, Peanut Butter Cookie and Cinnamon Churro. Gluten-free treats are baked fresh every Tuesday and Thursday! Little Bird makes everything from scratch inside their charming Old Town bakery. Using only the purest raw ingredients, you’ll never find mixes, artificial colorings or flavorings or preservatives. But you will find plenty of gluten-free options! Their selection includes a Flourless Chocolate Torte whole or by the slice, coconut macaroons which are also dairy-free, assorted custards and puddings, fruit bars, blondies and salted almond clusters. If you’re looking for dessert, The Chocolate Cafe is always a good place to start. As a hub for all things chocolate, you’ll find Chocolate Martinis, Toffee Chocolate Brownies, Apple Creme Brulee, Bacon Stout Cheesecake and several gluten-free options. If you’re avoiding wheat, choose Chocolate Decadence, Chocolate Noir or Trifecta, a gluten-free, three-layer dessert with a bittersweet chocolate cake base, a bittersweet chocolate mousse and white chocolate mousse topping. Mary’s Mountain Cookies are famous in Fort Collins for a reason. The business began right here but has since spread to Loveland, Broomfield, Missouri and Montana. Gluten-free options include M&M, chocolate chip and snickerdoodle cookies. A few of these are available in a special case in the store every day, or you can place a special order for an event or special occasion! When you’re in a craft beer haven like Fort Collins, it can be difficult to track down gluten-free drink options. Unfortunately, we don’t have a gluten-free beer brewery in the city yet, but we did round-up Northern Colorado’s best ciders! 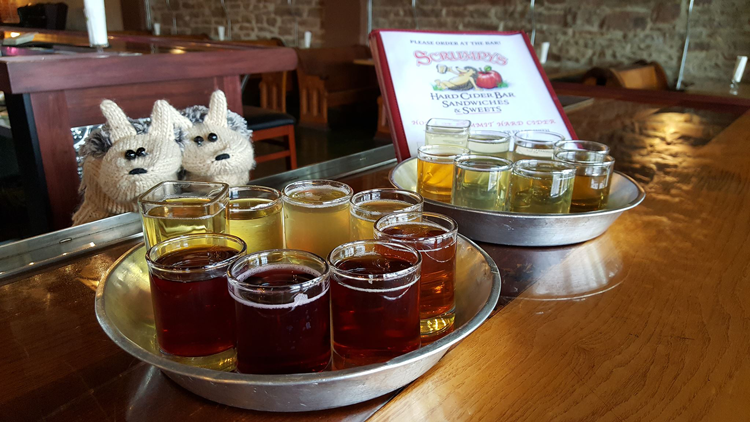 The list includes Scrumpy’s, FoCo’s leader in all things apple cider and CooperSmith’s Pub & Brewing which brews a few hard ciders each year. We’re also lucky enough to have six distilleries right here in Fort Collins! Because distillation eliminates the molecules that cause gluten reactions, these tasting rooms are a great option in FoCo. Learn more about Elevation 5003 Distillery, Feisty Spirits Distillery, Mobb Mountain Distillery, Old Town Distilling Co., Coppermuse Distillery and Old Elk Distillery in this article from Visit Fort Collins! Then, visit their tasting rooms for a locally-made treat. If you have a favorite gluten-friendly destination in Fort Collins, share it in the comments below!